Athens, Circa early 5th century B.C. 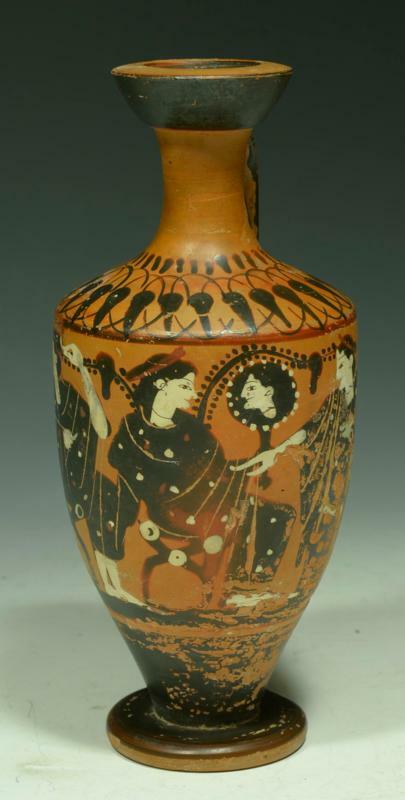 Slender cylindrical oil vessel decorated in black figure technique and nicely painted and incised with a mythological scene consisting of the Three Graces; ea women sitting on Diphroi, while the middle feamle holds up a mirror that reflects her face back to the viewer. Lotus bud frieze on the shoulder. Size: 8 inches (20.1cm) Height. Very lovely in person. Provenance: Ex Collection Dr. med. G.S., Nuremberg (1958-2003), former collection Hans Piehler (1874-1961), which in 1965 for the collection G.S. was acquired.